Join the Connecticut State Grange as we kick-off Grange Month in style at the Connecticut State Grange Rally. Show your Grange spirit and have some serious fun on Sunday, April 3rd, 1:30 PM, at Cheshire Grange Hall. This exciting event will have you cheering on the many fun and exciting aspects of the Grange. April has been declared Grange Month by National Grange President Ed Luttrell, with the 2011 theme: Connecting Communities Through Service. The celebration will continue throughout the month as Community Granges throughout the state will be opening their doors to the public for family-oriented events focused on the contributions of the Grange in their communities. Be sure to check out the complete Calendar of Events on the Connecticut State Grange website. The Connecticut State Grange will host a number of additional events in addition to the Grange Rally. Bowl your best game and support the teams at the "Bowl Across America" Bowl-A-Thon fundraiser sponsored by the Connecticut State Grange Youth and Junior Committees. This event will be held on Saturday, April 9th, 1:00 - 3:00 PM, at Highland Bowl, 1211 Highland Avenue, Cheshire. The cost is $20.00 per person which includes two games and shoe rental. Camp Maud Isbell Berger, in it's 56th year, is hosting the annual Camp Berger Clean-Up Day on Saturday, April 23rd, beginning at 9:00 AM. Located on scenic Park Pond in Winchester Center, volunteers are asked to bring rakes, brooms, and cleaning supplies to help ready the Camp in preparation for the upcoming camping season. Join the conversation on Wednesday, April 27th, as the Connecticut State Grange will be hosting an online chat beginning at 7:00 PM. All aspects of the Grange will be discussed including ritual, agricultural and legislative initiatives, Grange events, community interaction and more. State President Jody Cameron, General Deputy Todd Gelineau and committee representatives will be there to answer all of your questions. 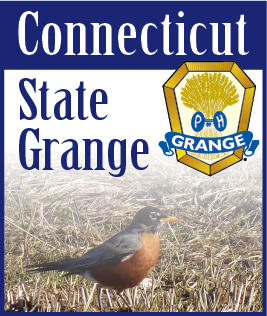 Go to www.CTStateGrange.org/GrangeChat and log on. Guests can sign-in using their real names or anonymously. The Social Connection Committee has lined up an evening of fun, food, intrigue, entertainment and surprises at the Connecticut State Grange Mystery Dinner. This event will be held at Cheshire Grange Hall on Saturday, April 30th, beginning at 6:30 PM. Tickets are $10.00 per person, and include dinner, program, and a chance to win mystery packages. Tickets will not be sold the night of the dinner - so if you plan to attend, get your tickets now. Tickets are available through each Pomona and from any member of the Social Connection Committee. Be sure to take photos of the meetings and events at your Grange, and submit them to the Public Relations committee for inclusion on the Connecticut State Grange website and in our Social Media offerings.